A new book I spotted in the library today, and borrowed: Tony Deverson's The Oxford Dictionary of New Zealandisms. Something made me flick it open, and look for Avondale Spiders. Yes, I found them. A landmark contribution to New Zealand English, The Oxford Dictionary of New Zealandisms is the most up to date and comprehensive work of its kind. The Oxford Dictionary of New Zealandisms is a collection of entries for some six and a half thousand distinctive New Zealand words and usages, with around half of that number shown in actual use by way of one or more illustrative quotations from written publications. The dictionary’s contents encompass the full range of New Zealandisms, drawn from a wide variety of domains and areas of New Zealand life, and including items both current and disused, contemporary and historical in reference, colloquial and non-colloquial in style, and borrowed and internally sourced in origin. 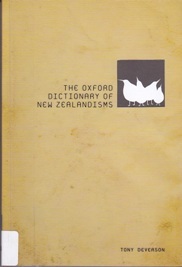 The Oxford Dictionary of New Zealandisms is the first to represent the entire spectrum of New Zealand English vocabulary since the publication of the late Harry Orsman's monumental Dictionary of New Zealand English in 1997. As for the cover illustration? "A box of birds."